In the weeks leading up to Adi's birth, I started baking and cooking food intended entirely for the freezer. If I'm being honest (and inviting you all to take some jabs at my sensibilities), some of what I stowed away was a bit...frouffy: butternut sage scones and carrot bran muffins, for the absurd but oh-so-likely future occasion that I need to throw a brunch together at the last minute; embarrassingly large quantities of cookies (NYT chocolate chip and chocolate gingerbread and snickerdoodles, I know you're curious) because nursing is really hard, and after a long day of rather painfully feeding my babe, I need to feed myself and you know what? These days, that involves a cookie. Not that cookies aren't a practical choice, but I can assure you that in plotting what would occupy my precious freezer real estate, I did consider courses other than dessert. I've frozen small bags of chicken stock to have on hand for easy rice or vegetable dishes, and I even froze some of Lisa Fain's fantastic seven-chile chili. which I make precisely once a year. But most of what I froze in the non-brunch, non-dessert department consisted of soup. And since we've now had the chance to defrost a couple of containers for no-thinking-required dinner, I can tell you that this curried carrot-apple number has proven a clear favorite. The recipe comes from Food and Wine, which I once made time to read. (These days, I barely get through a Saveur before the next one arrives.) 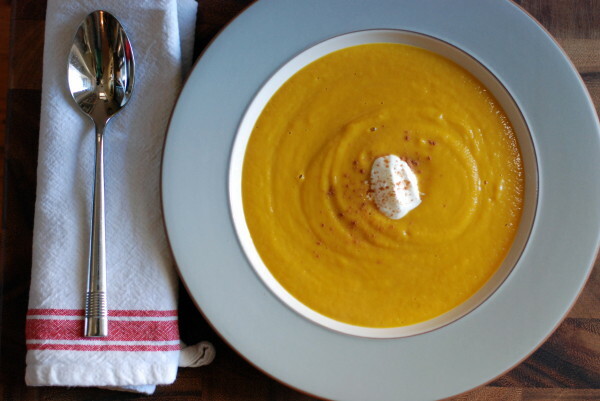 I love this soup: its pungency and spice are tempered by plenty of sweetness from carrots, apples, and a brilliant secret ingredient: gingersnaps. While the recipe calls for chicken stock, I used water and was quite happy with the results. I also shortened the ingredient list, because vegetable soup mustn't call for one of every single winter vegetable. Skipped fennel, added more leek. Skipped fussy garnish in favor of a simple spoonful of yogurt. Wasn't sad. The soup went into the freezer perfectly smooth. It separated a bit while defrosting, but that resolved itself once I heated up a bowlful. These days, the mornings fly by, and then I realize that suddenly it's 1:30 and I haven't thought about lunch. This soup's been a lifesaver. The fact that it's delicious? Well, that's icing on the cake. Melt the butter in a large pot over medium heat. Add the onion, leek, and generous pinches of salt and pepper and cook, stirring occasionally, until softened and just starting to brown, about 10 minutes. Add the carrots, celery root, apple, gingersnaps, curry powder, garlic, ginger and thyme and cook, stirring, until the carrots and celery root soften slightly, about 10 minutes. Add the stock or water and bring to a boil, then simmer over moderate heat until the vegetables are very tender, 25 minutes. Working in batches, puree the soup in a blender (regular blender is best, but immersion blender will also work) with the sour cream/yogurt and vinegar until smooth. Taste, and season with salt and pepper as needed. Serve with a dollop of yogurt and an optional (but very lovely) dusting of freshly grated nutmeg or some crumbled gingersnaps. I was poking around on Food52 the other day and came across a recipe for Mama's Summer Gazpacho, from one of my favorite early participants in the site. The headnote above the recipe was equal parts loving ode and adamant defense: "Purists may question this recipe's lack of bread, or the use of tomato juice, but I firmly believe..." and so on. She was right to defend herself. Gazpacho is a deeply personal thing, and when people say they have their favorite recipe, what they probably mean is that they almost definitely like their own gazpacho better than yours. Some people are loyal to entirely smooth versions containing not much more than tomato. Others swear by those sweet-ish gazpachos containing watermelon. And while I've never heard someone hold white gazpacho above red as their favorite, those people must be out there, somewhere. Pretty much every time I serve or eat gazpacho, I look around the table and see that people have strong opinions about what's in the bowl. They grew up on a certain kind of gazpacho, and convincing them that yours is equally lovable may be out of reach. There are exceptions to this rule. 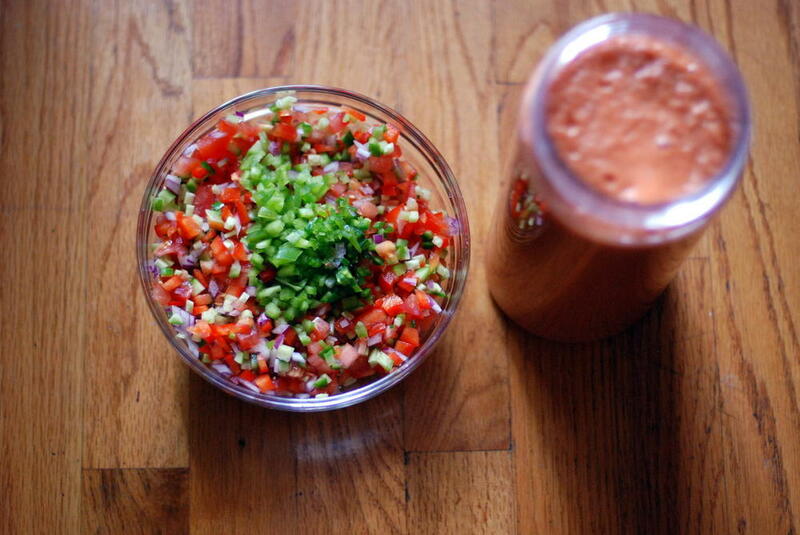 We recently swooned over gazpacho made by our friend Josh, which was based on (gasp!) canned tomatoes, and stood up well to the best fresh versions I've had. It wasn't my recipe, but you better believe I asked him to share it. It's a great one for the files, especially when you're craving cold soup and fresh tomatoes aren't quite ready for a spotlight. I'll share it on here one of these days. the smooth soup does not include bell peppers, because I'm pretty sure pureed green bell peppers ruin things. The most important thing about my gazpacho is #2 above, the two distinct textures. I prefer my gazpacho not entirely smooth, and I especially love the sensation of a smooth soup punctuated by perfect little chunks of all the vegetables. Dicing does take time, but I tend to zone out as I do it, and once I get into the rhythm, the process can be meditative. The other benefit of having two separate textures is that I really don't like green bell peppers in blended gazpacho, because I find that they make the soup turn much more quickly, sending off a gassy flavor after a day or so in the fridge. I don't mind green bell peppers as part of the chopped salad, though, since somehow this helps keep their potency at bay. So here it is: my favorite gazpacho. Maybe not your favorite, but perhaps you'll find some things to love about it nonetheless. Set your cutting board on a work space, and put one medium bowl and one large bowl next to the cutting board. The medium bowl is where you'll collect your diced vegetables for the toss-in; the large bowl will hold all the big chunks that you'll eventually puree. Toss them into the medium bowl as you go. My approach is to dice the parts that seem easiest, and toss the edges and other odd pieces into the large bowl for blending. When you're finished, you'll have a very pretty diced salad. Add the remaining ingredients to a blender in two batches, trying to add about half of each ingredient in each batch so you can taste and adjust seasoning as you go. I often add an extra teaspoon or so of white wine vinegar after tasting a batch. Either way, once you've blended everything, combine in the large bowl or a pitcher, stir to combine the two batches, and taste again for any needed adjustments. At the first of these dinners we attended, the table was full of exotic dishes: fava bean kuku loaded with barberries, grape leaf and yogurt pie, and mutabbaq. Everything went together, because everything came from the same brilliant mind. We left stuffed. For the second dinner, we all went back to the well, digging for recipes that had languished on our to-do lists for too long. Josh made a saffron ravioli served with pink peppercorns. Bryce made the spinach-feta fritters that were a total pain but really delicious. And I finally flipped back to the page of Jerusalem with three soups on it, two of which I'd already made. 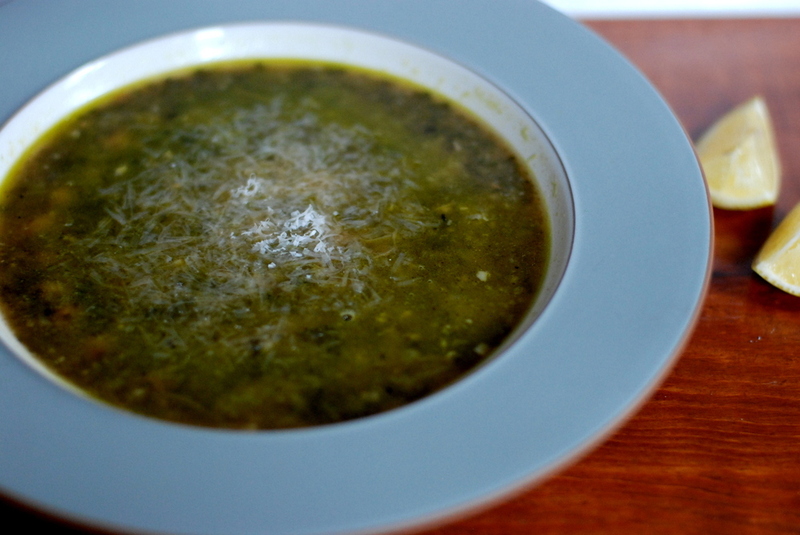 This time, I made the third: a very green soup made of watercress. What do you make of watercress soup? It sounded like a thin, brothy bowl, and I was worried that without a poultry broth, it would come out sort of bland. Fortunately, I was wrong. Watercress is so flavorful! To think I've been missing out on its spicy freshness all this time. The sweet spinach provides a nice counterbalance, but what really makes the soup is its garnish -- if you can call it that: a big pile of carrots and celery, roasted in plenty of spices until crispy and fragrant. Plus Greek yogurt, of course. Let's get the special-ingredient pep-talk out of the way. You need some ras el hanout, a Moroccan spice blend with as many varieties as people in Morocco. That said, I've seen jarred versions at two area grocery stores, so hopefully you're in luck. The other thing you need is rose water. On one hand, it's crazy to buy a bottle of rose water when you only need a tablespoon. On the other hand, my bottle cost like $5, I've had it for years, and it never seems to go bad. So there you go. If you don't want to buy rose water, you can still make the soup. But the rose water does lend fragrance and overall intrigue, so if you're even considering getting it, go for it. As good as this soup is the day it's made, it improves with time, as the flavors come together and smooth out a bit. There's no problem making the garnish in advance, either. Just give them a quick reheat in a 350-degree oven (10 minutes?) before serving and you'll be all set. Heat the oven to 400°. 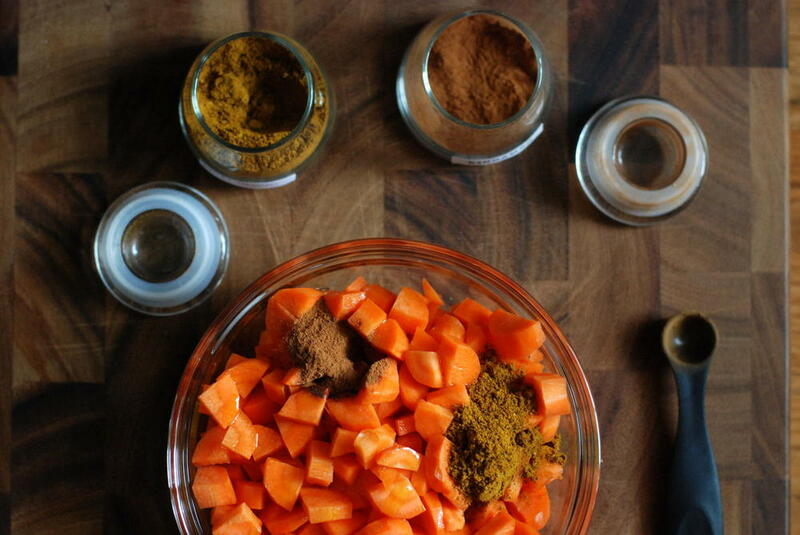 Mix the carrot with a tablespoon of the oil, the ras el hanout, cinnamon and some salt, and spread flat in a roasting tin lined with baking parchment. 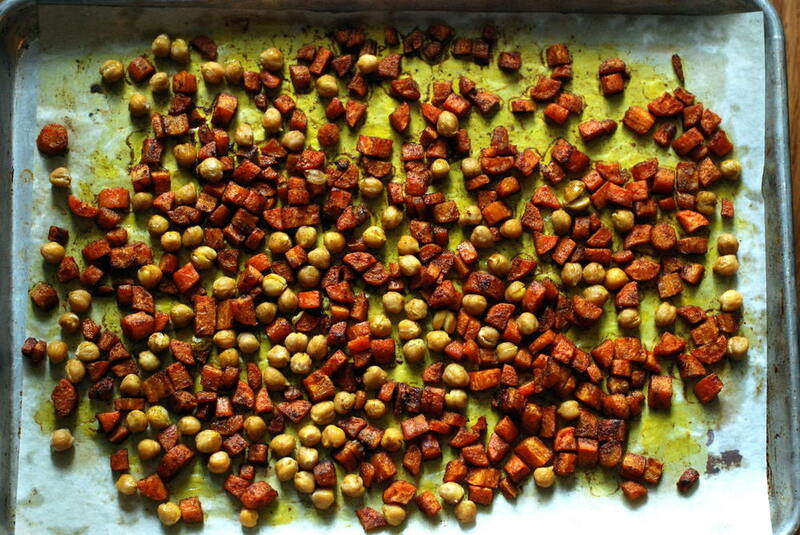 Place in the oven, roast for 15 minutes, then add half the chickpeas, stir well and and cook for another 10 minutes, until the carrot is soft but still has some bite. Meanwhile, in a large saucepan over medium heat, sauté the onion and ginger in the remaining oil for about 10 minutes, until soft and golden. Add the remaining chickpeas, stock, watercress, spinach, sugar and some salt, stir and bring to a boil. Cook for a minute or two, until the leaves wilt, then blitz in a food processor until smooth. Stir in the rose water, taste and add salt or more rose water as required. To serve, divide the soup into four bowls and top with the hot carrot and chickpea mix, and about two teaspoons of yoghurt per portion. Yotam Ottolenghi is chef/patron of Ottolenghi in London.